An engrossing and revolutionary biography of Queen Isabella of Castile, the controversial ruler of Spain who sponsored Christopher Columbus's journey to the New World, established the Spanish Inquisition, and became one of the most influential female rulers in history. 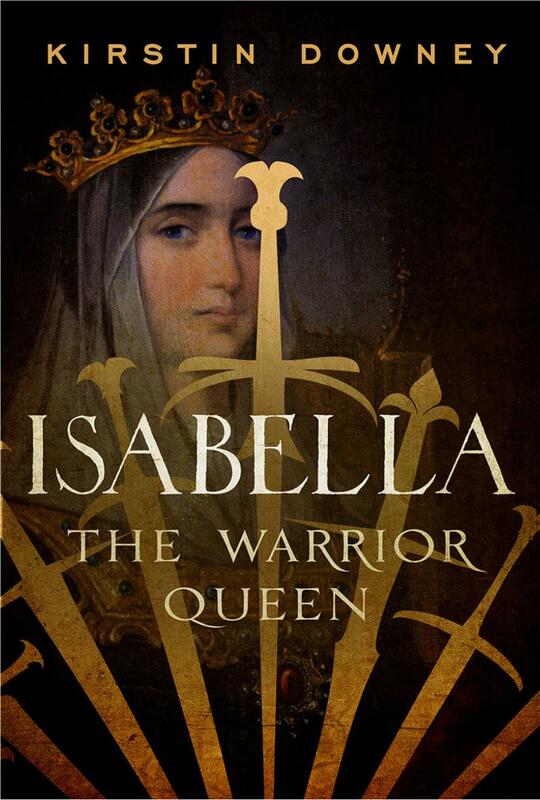 Born at a time when Christianity was dying out and the Ottoman Empire was aggressively expanding, Isabella was inspired in her youth by tales of Joan of Arc, a devout young woman who unified her people and led them to victory against foreign invaders. In 1474, when most women were almost powerless, 23-year-old Isabella defied a hostile brother and a mercurial husband to seize control of Castile. Her subsequent feats were legendary. She ended a 24-generation struggle between Muslims and Christians, forcing North African invaders back over the Mediterranean Sea. She laid the foundation for a unified Spain. She sponsored the trips of Columbus and other explorers to the Americas and negotiated Spanish control over much of the New World with the help of Rodrigo Borgia, the infamous Pope Alexander VI. She also annihilated all who stood against her and against her faith by establishing a bloody religious Inquisition that would darken Spain's reputation for centuries. Whether saintly or satanic, no female leader has done more to shape our modern world, where millions of people in two hemisphers speak Spanish and practice Catholicism. Yet history has all but forgotten Isabella's influence, due to hundreds of years of misreporting that often attributed her accomplishments to Ferdinand, the bold and philandering husband she adored. Using new scholarship from Jewish, Muslim and Eastern European sources, Downey's luminous biography tells the story of this brilliant, fervent, forgotten woman, the faith that propelled her through life, and the land of ancient conflicts and intrigue she brought under her command. Frances Perkins is no longer a household name, yet she was one of the most influential women of the twentieth century. Based on nine years of research, and exclusive access to Perkins’s family members and friends, this biography is the first complete portrait of Frances Perkins, who was named Secretary of Labor by FDR in 1933. Book available for purchase now! Contact your favorite bookseller! Nancy Pelosi, Speaker of the House, calls Woman Behind the New Deal "Fascinating." "Frances Perkins Rides to The Rescue - Again" Downey writes guest column for AFL-CIO about the importance of unemployment insurance as the Department of Labor reports that the unemployment rate skyrocketed to 8.5% in March 2009. 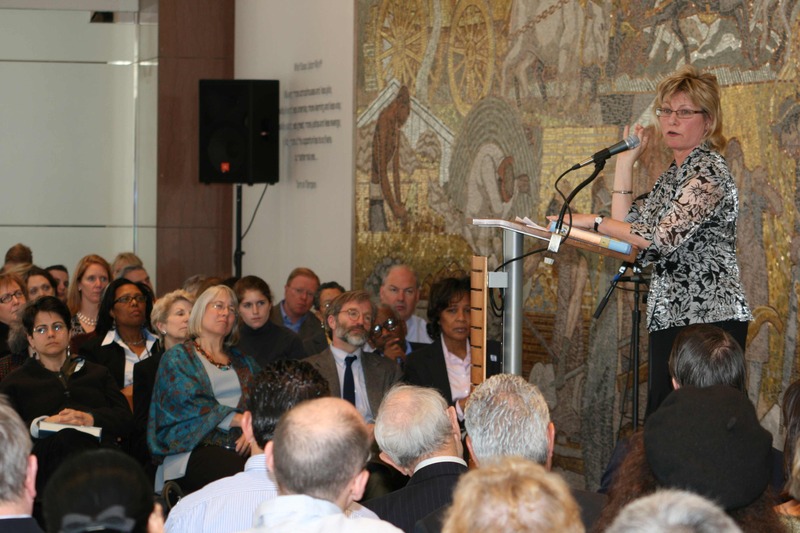 VIDEO: Downey gives a talk at the Library of Congress on March 23. 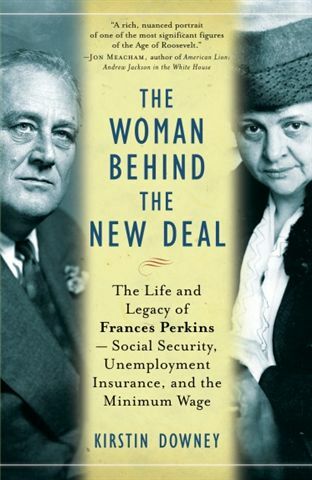 AUDIO: Host, Marty Moss-Coane plays a recording of Frances Perkins talking about social security, and then interviews Downey about Perkins's legacy as FDR's secretary of labor. VIDEO: Amy Goodman interviews Kirstin Downey about the Triangle Shirtwaist Fire of 1911, Frances Perkins and her tremendous influence on FDR and the New Deal.